I believe it is hardly a secret that pole plants have been used by ski racers for a very long time in slalom and GS. However, while conducting coaching seminars in US and Canada, I have discovered a number of misconceptions about the use of the pole plant in modern technique. Many coaches and ski instructors believe that for making carved turns on modern slalom skis the pole plant is not needed. Some go even further to say that the racers do not even use the pole plants any longer. Others are still of the opinion that the pole plant is still used primarily for turning the skis. In this article I will try to highlight the incorrect nature of these erroneous assumptions. First of all, I would like to point out that while I will be talking about the use of a pole plant in slalom, most of what will be said here applies to GS and even the speed disciplines. The evolution of ski equipment has resulted in contemporary super-G and DH courses with plenty of complete round turns in them. In order to efficiently link the arcs of such round turns ski racers often use a pole plant or a pole touch, even in speed events. 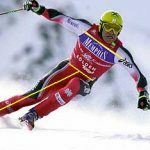 Speaking of slalom, we can say that the pole plant is generally used most of the time everywhere, except for straight flat sections of the course. To emphasize the necessity of a pole plant, Austrian coaches often repeat the saying: “if you left your pole plant at home, run there and get it instead of running the course”. I would recommend this little rule to all junior racers and their coaches. Such a pole plant made at an angle to the direction of travel blocks the movement of the upper body, especially if it is in a countered position to the legs. It is quite obvious that the pole plant executed in this fashion will trigger rotation of the legs and, subsequently, of the skis. Before the new skis evolved and we were still on long straight skis, racers often used rotation of the skis at the initial phase of the carved turns, in any radius, from slalom to DH. Modern racing technique, however, is all about striving for linked clean arcs. For this, neither a pronounced countered position, nor blocking pole plants are needed. Sometimes blocking pole plants are still used when racer gets very late coming out of the turn or skids the bottom of the arc. However, in such situations, even a perfectly executed blocking pole plant does not prevent a skier from a massive time loss. For this very reason, one can rarely, if at all can see blocking pole plants used by leaders of the World Cup. I believe that coaches who are still teaching their racers the mechanics of blocking pole plant are significantly behind the times. Some colleagues, coaches and instructors do not pay enough attention to teaching the proper use of a pole plant, at all. Their motivation is usually based on belief that many high level racers presumably do not make any pole plants. This assumption is simply wrong and such an approach to teaching the fundamentals of modern technique will have a negative impact on any young or mature racer’s progress and results in the long run. Undoubtedly, then, the role of a pole plant has changed tremendously. Both racer and coach need to have a clear understanding as to when and why pole plants are used. As mentioned in other articles on this site, the arc of a modern turn has a shape of an accelerating comma, slightly tighter at the top and opening toward the bottom. 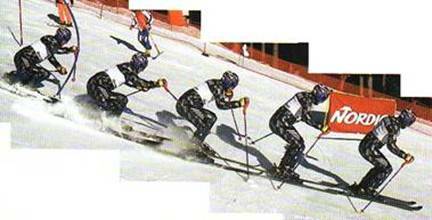 In order to produce this shape, racers move more of their weight onto the straighter tails of the skis at the completion phase of the turn. However, for engaging the shovel of the ski at the beginning of a next turn, a racer needs to move his or her weight forward or, at least, return it to a balanced position over the middle of the skis on a flatter terrain. This process of balance adjustment is often referred to as re-centering. The actual range of re-centering depends on the shape of the arcs the skier is trying to link. It is evident that on the flatter straight parts of the course re-centering is minimal and its execution does not present any problems, even to very young racers. However, on steeper terrain, even decent racers often “get stuck” back, either re-centering late or failing to re-center at all. More often than not, this fatal flaw is associated with the poor execution of the pole plant or total lack thereof. Therefore, in modern technique the pole plant is used for timely and effective re-centering. In the sequence below, I am demonstrating the pole plant. In frame 1, I have most of my weight on the tail of my right ski. Now, a properly executed pole plant assists me in: 1) Projecting my center of mass forward, and 2) Starting to get some pressure on the shovel of the “new” outside ski. Within a tenth of a second I am re-centered and able to engage the shovel of my left ski with the snow (frame 4). Granted that in this sequence I am making a turn on a fairly flat hill, so the range of re-centering needed is small and does not require a very aggressive pole plant. However, in a race course set on a steeper hill, a very strong aggressive pole plant is often needed. In fact, you can see this when watching male slalom racers on the World Cup, where majority of courses consist of steep and very steep parts. Also, leading ladies in slalom, such as Janica Kostelic and Anja Pearson, can execute absolutely perfect pole plants when it is dictated by the course. I would like to point out that on the flat straight sections of slalom courses, you may not need the pole plants and they may even slow you down. We need to realize that, the flats are only an exceptional case, requiring minimal re-centering. However, this exception is mistakenly interpreted by some coaches and racers as the norm for all terrain in modern technique of slalom and GS. Unfortunately, the problem is magnified by the fact that children and junior racers mostly train and race on fairly flat hills, where it is difficult to recognize and to feel the need for the pole plants. 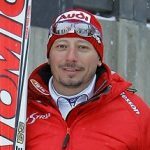 Therefore, explaining the role of a pole plant in modern technique to young racers and actually providing the situations for effectively acquiring the proper pole plant should be one of the main technical goals of any ski coach. In order to accomplish this task, coaches and instructors need to understand all of the nuances of proper pole plant technique. Let’s review an example presented by one of the most consistent ski racer of modern times, Andre Amodt of Norway. 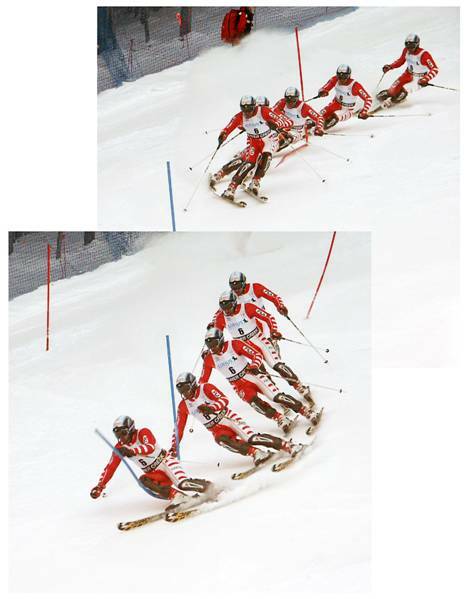 In this photo sequence, Aamodt is executing a slalom turn on a moderately steep section of a course. 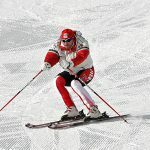 Before getting into a detailed analysis of the racer’s pole plant, I would like to point out one very important general aspect of pole planting technique, which is, in my opinion, often incorrectly presented by some coaches and many ski instructors. I am referring to movement of the wrist. For an odd reason, some colleagues, while teaching the pole plant, reduce the entire technique to the flicking of the wrist or take the wrist movement as the basis of the pole plant. 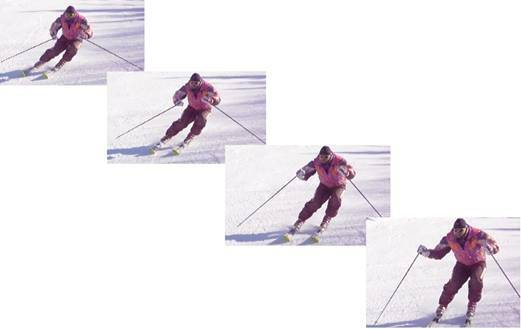 I guess they do not realize the amount of force and intensity needed for a pole plant in modern technique to make a skier’s center of mass, often positioned behind the feet within inches of the snow (frame 2), return into the central position (frame 4). If look carefully at high level racers, you can notice that the ski pole often bends significantly in the process of the plant. For that very reason, racers have not used light carbon-graphite poles in slalom until recently, after these poles had been made stronger. The early versions of these light thin poles used to arch excessively during the pole plant, which reduced their effectiveness. Now let’s see how the pole plant is made by one of the best technicians in the world, Andre Amodt. In frame 1 racer moves his right arm forward in order to block the gate. At this moment, the wrist and the forearm are aligned and act as one unit. However, immediately after the gate is blocked (frame 2), Amodt, actually does move the pole forward by a quick flick of the wrist. The purpose of this movement is to “hook up” the snow surface as far in front of the body as possible. This anticipatory move assists in effective re-centering. The pole plant executed too far to the side or too close to the racer’s feet is ineffective and can be detrimental as it can produce the unwanted rotational blocking effect. It is important for every racer and coach to understand that by the time the pole tip touches the snow, the wrist and the forearm are aligned and fixated again with the entire arm, from the elbow to the tips of the fingers, working as a solid unit. We see this clearly illustrated by Amodt in frame 3. It is also worth mentioning that as the pole plant is made, a racer should try to bring forward the other arm, as well. 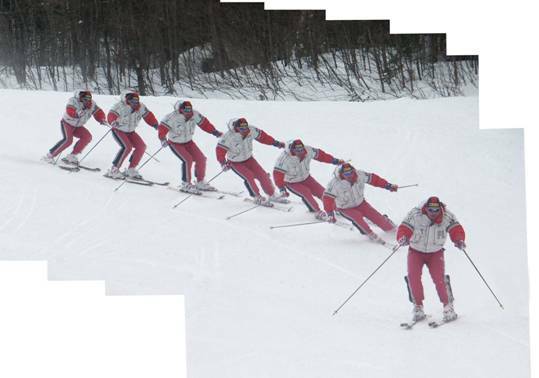 Although, sometimes done for a double pole plant, it is also very beneficial when making a regular pole plant, because moving both arms forward helps to avoid an upper body rotation and puts the racer in the most efficient position where the upper body and the skis are square before entering into a new turn (see frame 5). Back to Aamodt’s pole plant sequence. We can see in frame 3 that the pole is being planted almost vertically in the area of the ski tips. To do this properly, it is crucial to have the arm extended slightly and the upper body slightly angled forward. Next, it is very important in pole plant technique to complete the plant correctly. Do not leave the pole tip in the snow and do not turn around it! Such a poor completion of the pole plant might greatly compromise your re-centering. It may, as well, cause the rotation of your skis and your loss of balance to the rear. In order to avoid these negative consequences, the pole plant has to be executed in a very fast and dynamic fashion. As soon as the pole tip penetrates the snow, the racer moves the arm forward in such a way that the pole tip comes out of the snow and moves back (frame 4). I would like to point out that this movement is accomplished mostly by the arm with almost no help from the wrist. I suppose we can clearly see how the wrist moves in relation to the forearm only in frame 3. The rest of the time it remains aligned and fixated with the forearm, so both the arm and the wrist act as one solid unit. I deliberately stress this small nuance of the pole plant technique. If the wrist is not fixated and relaxed, than the racer will not experience any effect from the pole plant and most likely will stop using it. This will inevitably stop his or her progress at some level, with the skier experiencing the dreaded plateau in his or her technique. Vogl, like Amodt, who blocks the wrist and makes the pole plant forward near the tips of his skis, carves clean arcs and re-centers early. 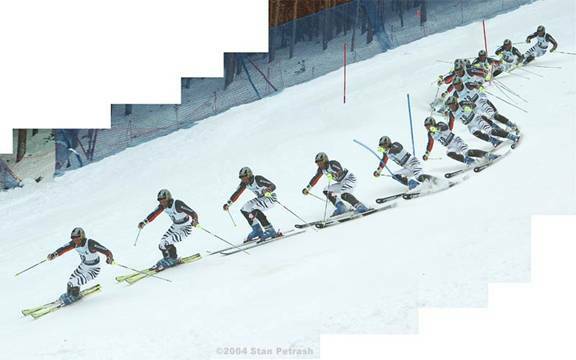 As we see Rocca making a turn on a very steep section of the course, he has pressure on the tail of his outside ski at the completion of the first turn (the last frame in the upper sequence) and than he makes a pole plant. Within a blink of an eye he re-centers and engages the “new” outside ski for carving another perfect arc (frames 2-4 in lower sequence). In GS racers normally have a little more time for re-centering. Therefore, they can often afford just making a light pole plant or even a pole touch. Nevertheless, these movements are very important for timing of re-centering and maintaining a rhythm. Racers use double pole plants in both slalom and GS. The double pole plant is a pole plant executed with both poles at the same time. It is quite natural that the double pole plant is more effective in certain situations. The technique of the double plant is almost identical to that of a single. More often, the double pole plants are used in moderately off-set sections of the course, where racer can stay practically square to the skis throughout the most of the turn, without creating a big difference between the directions of travel of upper body and the skis at the end of the turn. However, often the double pole plants are just a matter of choice for some racers. Double pole plants assist in large range re-centering and stabilize the skier laterally at the completion phase of the turn. Double pole plants are really necessary in the transitions from flat to steep where greater range of re-centering is usually needed. In very off-set turns, the double pole plant may be ineffective, as it could result in the excessive movement of the body across the hill. change the shape of the turn making double pole plants between more shallow turns and single ones between rounder turns. There is one aspect in teaching pole plants that we cannot overlook. I am talking about the selection of the proper length of the poles. In selecting the poles, it is always better to err on the longer side. If the poles end up being too long, you can always cut them. I often see a lot of junior racers skiing with the poles that are simply too short. Even if they make pole plants, the pole is not placed far enough forward so their pole plants are practically ineffective. If this is the case, then juniors do not see any benefit of a pole plant. There is no exact recommendation for the length of poles. Usually the correct length is figured out by experimenting. I would not recommend selecting the poles just based on the height of the racer. The optimal pole length depends on proportions of the racer, on the ratio between the sizes of the torso and legs, and on the length of the arms. In order to pick up the approximate length of poles for further experiment, you can step into the skis and stretch the arm forward. Then, stick the pole into the snow. The pole of the right length will keep the extended arm parallel to the ground. Bear in mind, though, that, most likely, poles selected this way will be a bit too long. However, by cutting them by a half an inch (1 -1,5 cm) at a time, any racer can arrive to the optimal pole length in a few days. A good test to see if the pole length is correct is while skiing not to experience any problems when flicking the wrist and bringing the pole forward, yet feel that the tip of the pole “hooks” the snow surface well ahead of the body propelling it forward over the skis. In conclusion, I would like to reiterate the importance of teaching the proper technique of the pole plant regardless of what disciplines of alpine skiing the junior racer may choose in the end. Even if the racers is destined to become a pure downhiller, the technique and coordination developed while making the pole plants will be very useful.